We bring you authentic lace motifs, small designs made in lace, manufactured in the traditional Belgian fashion. The motifs are presented on beautiful display cards that emphasize the details of the fine artwork and exquisite workmanship of the designs. The cards can be used as a gift, a marvelous invitation, or a desirable collectors item. We also offer a wide variety of bookmarks, handkerchiefs, gift sets, Christmas ornaments, and miniature magnets, all with the lace motifs. Please call Cynthia for our price list! We now offer custom lace designs of your images! See our custom designs for the St Louis Cathedral and for the National Shrine in: “In The News”. Call Cynthia at (703) 318-1955 to discuss! Celebrations Designs offers the Belgian motifs as a specialty item, suitable for religious stores, gift-, wedding-, and specialty stores. The cards and motifs serve as an alternative to the throw away card market. They provide that extra touch that says “I care”, that sensitive and sensational feeling that this is different from the pack. 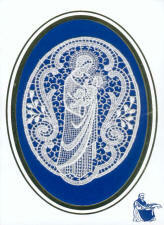 Celebrations Design is the sole distributor of these motifs in the U.S. We are a wholesaler and sell to retailers only. Celebrations Design holds the copyright © for the designs in the U.S.
Celebrations Design is owned and operated by Cynthia Dovens in Herndon, Virginia, just outside of Washington DC. The company has been around for many years, but has, in recent years, focused on these gems from Belgium. Since these designs are unique in the marketplace, they are well liked in upscale and specialty stores (e.g. religious stores, gift stores, card stores). They tend to give excellent returns for the merchant. Celebrations Design sells to retailers only. Cynthia is very enthused about the motifs and her passion for these beautiful pieces of artwork is sure to catch you too!